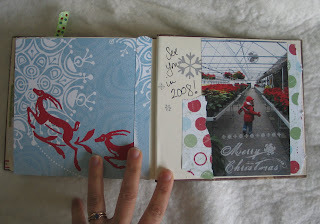 I took a few photos of a scrapbook I made a few years ago that I thought included some pretty fun pictures. I'm always trying to take pictures of my son that really capture who he is at that age or what he's doing. A way of stopping a moment in time. I tried to create a mix in the scrapbook of still shots of decorations, activities, and my son being cute. 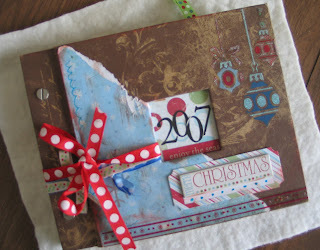 I also cut up a few special Christmas cards we received and added them to the scrapbook as well. 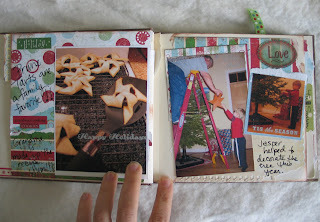 Oh, and a tip- I had the blank scrapbook already made at Christmas so after, when my enthusiasm for the holiday waned, all I had left to do was add the photos and text. One of the best techniques I stumbled on while putting this scrapbook together was to apply rub-on's directly to my photo's surface. 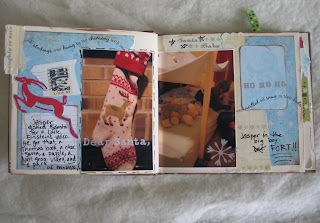 It turned out to be a really nice way to integrate the photo into the page as a whole. I also got my set of gel pens for Christmas that year and decided to try writing right in the book. Disappointed- but dealing with it. From One Holiday to the Next!! !